As a gigging musician your hands should be focused on playing music. Not turning pages. While your Fakebook Pro app made it easier to carry your charts and lyrics, you still have to take your hands off of your instrument to change pages. Unless you get a wireless pedal, of course. The Stomp pedal is a rugged, durable, and reliable app controller, making it the obvious choice for professionals and hobbyists alike. 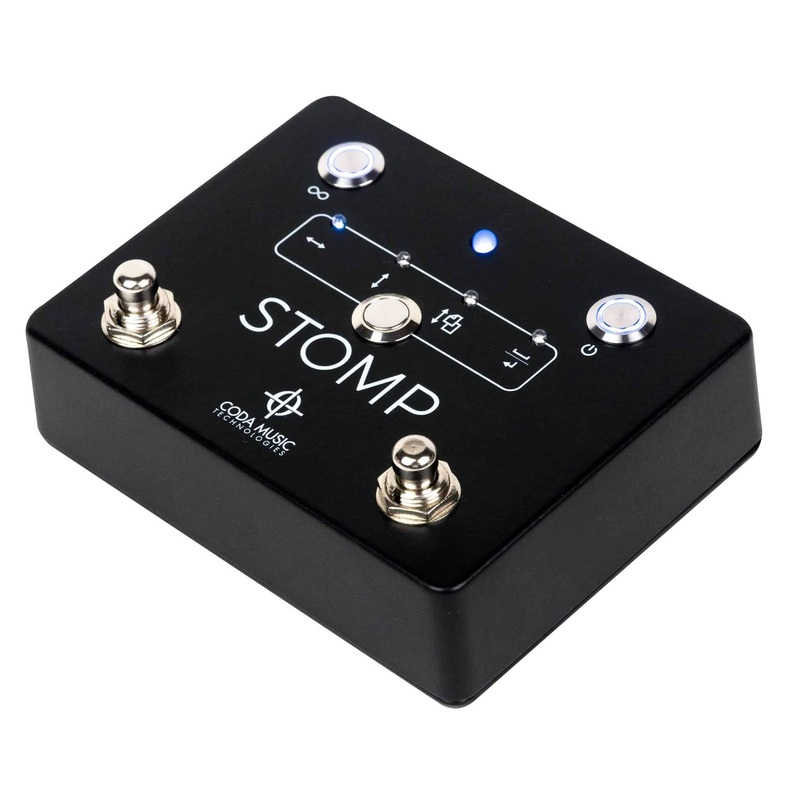 Stomp is housed in a solid metal enclosure, rugged enough to be run over by a truck, so it will handle any gig, night after night. Just throw it in your bag or attach it to your pedalboard and go off to the next gig. Stomp uses Bluetooth 4.0 and is tested compatible with the Fakebook Pro app. Check it out at https://codamusictech.com/products/bluetooth-page-turner-music-pedal-for-tablets . What do the icons Cb and T do? The "Cb" icon enables you to edit the chords (which is the default editing mode), while the "T" icon lets you edit or insert text/lyrics. This text layer is enabled when you import e.g. a chordpro song (with both chords and lyrics), but you can add a text layer to any chord chart. Why does the chord text suddenly get really narrow when editing and yet the rest of the chords are normal size? You are probably trying to squeeze to much chords in on each line. Fakebook Pro will not break lines anywhere, but does its best to honor the 4/6/8 bars per line setting. So, if you don't insert any tabs and bar lines (a bar line will automatically also insert a tab space) or manually break the line with an enter/return, the chord symbols will be scaled to fit. If they are to narrow to read comfortably, change the settings or manually break the line. Czy jest w aplikacji język polski? No, sorry. The Fakebook Pro app is only available in English at this point. The Fakebook Pro app runs smoothly on the tablet of our singer. But now I got a problem! However, I now want to use an old Android tablet as a backup at gigs (Android 4.2.2 - Jelly Bean). Installing Fakebook did not cause any problems, however, when I wanted to add my songs, I was not able to find my Google Drive. I have access to the drive at this tablet. Maybe I'm doingsomething wrong and you can help me? The native file browser support for cloud storage like Google Drive, Dropbox etc wasn't introduced in Android until 5.0, this is why you cannot see it directly from Fakebook Pro. However, if you use the Google Drive app to browse your files and tap a supported format (like a PDF or PDFB script), you should get a question whether to open this in Fakebook Pro. Alternatively, you can tap the "three dots" icon on the file tile and then select "Open with" in the dialog. This should also allow you to select Fakebook Pro. * PDF on Android: does Fakebook use its own built-in PDFcreader, or the OS installed one? I must say iKlip's PDF reader is of much higher quality than PDF reader apps on Android. * From what I read on your websites, it is possible to load one's ownccreated PDF files? * How does scrolling through multiple page scores work? Can a Bluetoothcfoot-switch be used? * Must one be online to use Fakebook? * How many pages of PDF can Fakebook handle? iKlip takes a very long time to load just plain text files exceeding 3 pages. And its playlist crashes easily after loading several files -- far too few for live gigging. On Android versions later than 5.0, Fakebook Pro uses the Android native PDF parser when importing the files. On older versions a proprietary and rather slow parser is used. When showing the resulting pages a very quick bitmap view is used in both cases. Yes, you can load your own music. Any footswich that uses the standard keyboard emulation can be used, this include all products from AirTurn and PageFlip, both two- and four-pedal models. The two-pedal version from IK (BlueTurn) should work, though I have not tested it myself. The four-pedal version from IK will likely NOT work, as they use some proprietary protocol. No, Fakebook Pro requires no internet connection. There is no hard limit on the number of pages, you are more likely to run into problems with storage space on your device. Regarding speed: as Fakebook Pro does the PDF parsing (which may be slow) already at import time, the searching, browsing, paging and displaying is quick. On most modern phones and tablets it should be instantaneous. Available now on Google Play: Rude Practice Pad release 0.15.0. This version allows the rudiment training app to be used in both portrait and landscape mode, on phones as well as tablets. It is also updated to fully support the latest Android flavors. Show and play all 40 official drum rudiments, with name and order according to PAS (Percussive Arts Society). Show and play 100 of the most common hybrid rudiments. Show and play 96 classic Stick Control exercises. Show and play exercises and warm-ups like the famous lifetime, pyramid and stone killer sequences. Let you select different snare drum sounds for the playback. Suggest rhythms to practice, including a “Rudiment of the day” feature. Sort and list rudiments according to the essential, original, standard, the quadrants etc. Link to textual descriptions and instructional videos showing all the 40 official rudiments, on pad and examples applied to drum set. Mail of the month - September - How much songs can you store? I've been using Fakebook Pro on a Samsung 12.2-inch tablet for a couple of years now. It has been a godsend! Thank your for your programming efforts.My database has now reached 4.5 GB in size. I'm using "Commander One" to copy my manual database backups to my Mac, since "Android File Transfer" on the Mac is limited to 4 GB files.This solution works well, but I'm wondering if Fakebook Pro will reach a limit to the size of the database. If so, can you tell me what that limit is? This is a really interesting question! While I know there are many users out there with database sizes on par with your, my personal song library is not that huge yet. But, the data is stored in an SQLite database and this database has a size limit of 140 TB. The EXT4 file system used on must Android devices has a 16 TB file size limit (older versions had a 2 TB limit). I guess the transfer issue you noticed had to do with the FAT32 limitation (4 GB) of the SD card. On Android 6 and above, which handle extFAT SD cards, this should not be a problem. From the product description on Amazon.com:* "Extremely accurate metronome, stores tempo for each song." Is there actually an audio metronome associated with the app? * "Spotify and YouTube links to reference recordings" Where are those links? Both the metronome and the Spotify/YouTube links are under the Play menu. In either the action bar or in menu, you'll find a Play icon. Press this to get a dialog with an adjustable metronome as well as options to search Spotify or YouTube, or direct links if available. How can I choose a split-screen or double-app option that would allow me to see the chart while also hearing the YouTube audio (or even be able to scroll back in the YouTube video to replay certain parts while viewing the chart)? Fakebook Pro is importing any PDFs I try to view on my phone e.g. if I try to view a PDF attached to an email. How do I stop that? This is actually an Android setting, and not controlled by each app: when clicking a PDF file your device has a default for opening it. In this case with the Fakebook Pro app, probably because you choose that default at some point (there is a dialog asking if you want to use the app "once" or "always"). In any case, you should be able to reset this default in the Android Settings app. Open that and look for the "Apps" section, in that section look for Fakebook Pro and click it. There should then be a "Open by default" subsection, in which you can clear any defaults or selectively set whether to open, not open or ask for an app every time. On some devices (e.g. Samsung), this may look slightly different, but the general idea is the same. On my Samsung G7 Edge there is a "Clear Defaults" button for the app, but that doesn't work work on its own. You have to also set "Go to supported URLs" to "Always ask". I did both Clear Defaults and the Always ask setting, problem is solved! How do I get rid of unwanted playlists? Well, lets try to through these, one point at a time. A dedicated music PDF app and nothing else: Well, obviously no. The transposable chord charts are a important addition and something that makes Fakebook Pro different from the other similar apps. I really like to be able to have set lists with mixed PDFs and chord charts, without having to switch between different apps. But that's me, and my gigs. The ability to load PDF into a master library from various sources - Dropbox, Google Drive, Livedrive, Local drive: Yes, any remote and local storage supported by Android can be used to import new music. The list automatically indexed: Yes, but some help is needed to do this (as in all PDF sheet music apps). Fakebook Pro stores the necessary index data in PDFB files. Other apps have similar methods. A simple way to create Set Lists from the master library without using copies: Fakebook Pro creates no copies when adding songs to set lists, only links in the song database. Some meta information for the Set List tunes - eg Key, Genre, Free form notes: Key and genre is part of the metadata. Song key is visible in the list view and genre (style) is fully searchable (so that you can search for e.g. all bossa songs in the free text search). Moving between Set List or Master Index PDF should be very quick: Yes, changing lists (as well as changing pages in a song or list) is instantaneous. PDFs are pre-parsed at import and adjacent songs pre-loaded for smooth page swipes. The ability to pinch zoom PDFs useful on smaller tablets: Yes, you can pinch zoom each page individually to match your preference. Chord charts can also be three-finger-pinched to adjust font size. All the features on Set Lists like adding/deleting/reordering: Yes, drag-and-drop, swipe to dismiss etc supported. The ability to annotate PDFs with various tools and save the annotations: Yes. A backup facility to Dropbox etc: Yes. Share backup via e.g. mail or remote storage. The ability to use JPEG, TIF formats as well: Yes and no. JPEG and PNG is supported. TIFF not yet implemented. A printing ability: Yes, standard Android print is supported. Move between pages using Airturn bluetooth pedal: Yes. Airturn, PageFlip, iRig as well as others. A price point of £4.99 would be acceptable: Yes, with good margin! The new version of the Andronome metronome has an updated look and feel, is updated to work with the latest Android versions and (most importantly) has some optimizations that will improve performance and help preserve battery life. Both the free Andronome and the low cost Andronome+ are updated. Check them out! Download and index two huge song collections! We just added new PDFB script files for 557 Jazz Standards - Swing to Bop and for The Book -- all in all about a thousand songs in jazz, funk, rock and other styles. Check them out at https://www.skrivarna.com/p/fakebook.html. Well, what can I say? Fakebook Pro version 3.0 is released and available from Google Play and Amazon. Check it out. Now! Why? Because it features autoscaling chord charts (making sure there are always 4/6/8 bars per row) and an updated playlist editor. And a lot of other small improvements to make your life as a gigging musician easier, That's why! I happily downloaded and use the Facebook Pro app on an 13inch Android Tablet. It has just the features I want and like and it's a very handy tool for my live performances as a singer/guitarplayer. When I have my setlist/playlist of songs in front of me, I sometimes try to drag songs to another position. For instance the third song I want to put at the first position. I drag it with my finger or thumb, but this is most of the time not working. The screen usually gives a pop-up screen where I can add or remove the song to/from a playlist. What is the trick here I am missing? I tried positioning my finger/thumb in all kind of ways, but it usually doesn't want to drag a song. There's no "trick" other than to touch-and-hold as close to the "handle" (at the edge) as possible. But I agree that this is not always so easy and the Android library used to implement this drag-and-drop feature works better on some devices than on others... Unfortunately this is a known issue that has been hard to fix. So, in the next version (3.0) this list will be completely replaced with a much more modern and easy to use solution. There is still a lot of testing needed before release, but this will eventually be fixed, I promise you! When I'm in a song text and want to go to the next or previous song text, I tap with my finger on the screen (usually on the edges) but it is also a coincidence if the page is turning. It works, but a lot of times it doesn't and the green menu on top of the screen comes down. What is the trick here to make page-turning work constantly? You can swipe left or right to change song, or tap at the edges. On the current version the "tap area" is defined to be the outer 1/7 of the screen, but you are no alone in thinking that this is too small to work reliably. So in the next version this area will be slightly larger (1/5 on each side). I just imported one of my large PDF files (Django Fakebook) and now I have 242 songs called "fakebook_django (###)". How do I get all 242 named? I have an index file with the names and page numbers. With unrealbook (my old app), I would load that index file in and it would use that to index/name all the songs. What can I do about that here in Fakebook Pro? Without the ability to mass edit the names, its not helpful for large PDFs. Please have a look at http://skrivarna.com/p/fakebook.html (this is the same landing page that you get to through the app when selecting Add new songs - Download from Internet). There you'll find some useful info about the PDFB scripts that Fakebook uses to download and index PDF song collections. The Django book is one of the PDFs that has an index there. I purchased Fakebook Pro to use on an old Samsung Galaxy 10.1 tablet, hoping to find a use for this old device. To my surprise, Fakebook Pro is working well on this device. But I have one challenge: I gig with a few separate ensembles. Most of the music we play from is multi-page, so I've settled on loading individual PDF songs as play lists. This works great because each individual song is listed in the playlists, and I can quickly switch songs. I need to maintain separate databases for the different ensembles, and I am having difficulty maintaining these separate databases on this ancient tablet. Is there a way to maintain these databases on my computer then transfer them to my tablet for use? I haven't heard of anyone wanting completely separate databases for different gigs before, personally I just create one "band playlist" for each group and then create setlists based on these. However, if you want to do this, you can always export the database using the backup function, preferably to some cloud storage. Rename the exported file to separate the different ensembles. Import, again using the backup-restore function. When I import a pdf that contains four pages of a single song, each page is created as a separate song in the database and a playlist is created that groups the pages. Is there any way to create a multi-page song or, alternatively, a way to add the song playlist to another playlist? The next major update (3.0, to be released May 1st) will "collapse" multi-page page songs so that they are easier to handle. Does the time signature impact functionality? No, not at this point. But it is stored in the database if it is included in the imported file format and might be useful in the future. I find the cursor position is not always correct (it is blinking on the left, but characters are added on the right) and sometimes I have to hit backspace 5 or 6 times before it actually does something. I can get through it, but it is painful. I know, this is kind of a sore point... It is on the to-do list as well. The cursor problem is actually a very strange (but known) bug in the Android framework. It always occur on the creation/first edit and when adding lines. Try to add a few empty lines, close the editor, re-open it and it should be fine. Trying to figure out a workaround for an upcoming release. I just installed Fakebook Pro on a new Chromebook Plus. It seems to work well except that when I try to "add new songs" by "download from the internet," it opens http://www.skrivarna.com/p/fakebook.html and doesn't show a path to the sites I need. I would like to be able to download from Google Drive but I can't seem to get there. Thank you for any help you can provide. To get your files stored on cloud drives, check under "Add new songs - Import files" instead. You can also browse to any site from the Fakebook landing page you noted. 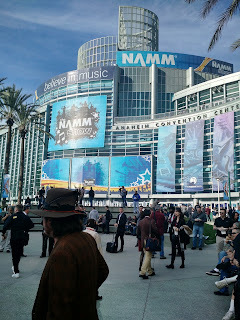 Skrivarna Software will be at the NAMM Show in Anaheim, CA, meeting musicians and colleagues from all around the world. Are you going? Drop us a mail at software@skrivarna.com and we'll have a coffee! 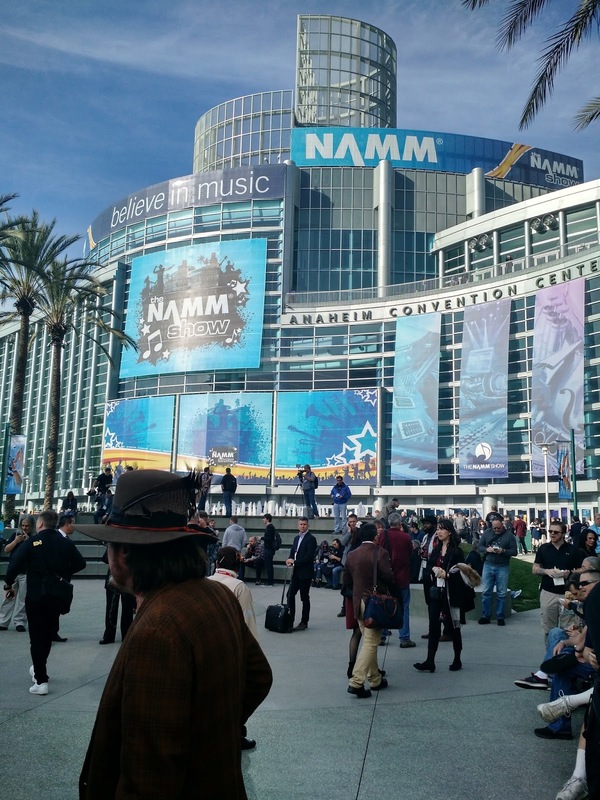 The NAMM Show is the definitive platform for the music, sound and event technology communities to unite with the mission of strengthening the music products industry and promoting the pleasures and benefits of making music. Held in Anaheim every January, The NAMM Show offers the latest products from more than 7,000 brands, cutting edge industry education across hundreds of sessions, as well as special events, concerts and experiences where "only at NAMM" moments take place. This year's NAMM Show is held January 25-28.